Finding the right ERP solution is not easy, even for an ERP provider. When my company, NexTec, was in the market for new accounting software (also known as an ERP system), we treated ourselves as if we were our own clients and went through a deep analysis of our requirements and a review of the best ERP solutions on the market to make our choice. NexTec is a consulting company that implements ERP, CRM and BI solutions. All of our work revolves around the projects we do for our customers and so our accounting is based on that, too. We chose Acumatica because it gives us more flexibility to cost and bill projects accurately with multiple rules. It has a very robust allocation engine. Acumatica provides a highly versatile platform, which is just what NexTec needed. It offers a variety of built-in customization tools, giving us more freedom with how to use the software. We can adjust the database fields, the appearance of the screens, and the business logic, all of which remains uninterrupted by upgrades. We have the freedom to adjust the software to fit our own needs and preferences, rather than using a one-size-fits-all solution. The last thing we needed was a complicated software package that entailed extensive maintenance and upkeep. 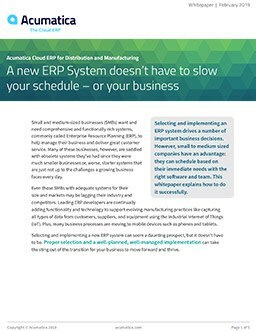 With Acumatica Cloud ERP, we already eliminated most of that battle, since there was no need to purchase and install additional hardware. Additionally, all upgrades are conducted automatically and all customizations are stored in the database, so we can backup data and code changes easily. Since implementing Acumatica, we have experienced a 33% increase in operating efficiency. It has proven to be a highly versatile software, allowing us to meet specific and changing business needs in our evolving world. That’s why it works for us and for many of our clients as well. The next feature we are really looking forward to implementing is the built-in dashboard tools which will provide key metrics for our project managers to keep an eye on our client’s projects and how we are doing. If you want to chat with me and learn more about how it’s working for us, feel free to contact me at lgillliam@nextecgroup.com or Nextec. I look forward to hearing from you. Lawrence Gilliam is NexTec's Director of Consulting. NexTec is an Acumatica Partner. Husband, dad, Alpha, runner, cyclist, technologist, shutterbug, beat junkie, gadget freak. Leimert Park, CA.